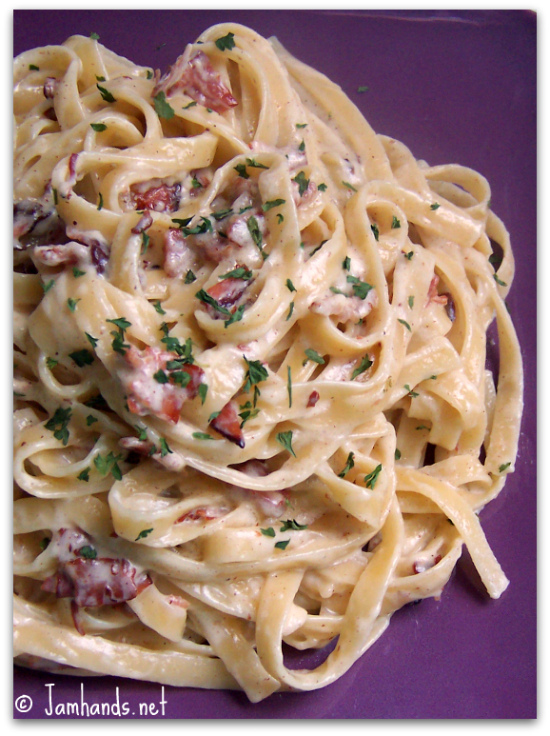 If you are looking for a twist on the same ol' pasta dishes, try this delicious recipe for Cinnamon-Prosciutto Carbonara. The cinnamon adds a unique and special flavor that goes so well with pancetta. 1. Saute the bacon and pancetta in a heavy large frying pan over medium heat until almost crisp, about 5 minutes. Sprinkle the cinnamon over the bacon and pancetta and saute until the bacon is crisp and golden, about 2 minutes longer. Cool. Whisk in the cream, cheese, and yolks to blend. 2. Meanwhile, bring a large pot of salted water to a boil over high heat. Add the fettuccine and cook until it is just tender but still firm to the bite, stirring occasionally, about 3 minutes. Drain. Add the fettuccine to the cream mixture and toss over medium-low heat until the sauce coats the pasta thickly, about 5 minutes (do not boil). Season the pasta, to taste, with salt and pepper. Transfer the pasta to a large wide serving bowl. Sprinkle with chives and serve.